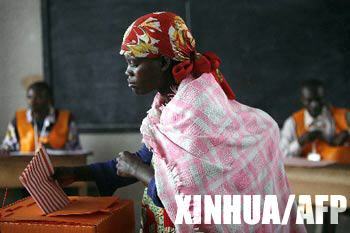 KINSHASA, July 30 (Xinhua) -- The Democratic Republic of Congo (DRC) on Sunday is holding its first democratic presidential and legislative elections since independence more than four decades ago, hoping to turn a new page for the war-devastated nation. With voting process officially starting from 6:00 a.m. (0700 GMT) on Sunday, voters queued outside polling stations, eager to make their choices from 33 presidential candidates and more than 9,700 legislative candidates vying for 500 seats in the National Assembly. "I care about whether the candidates can bring us security, justice, development and stability, " said Morgan Kunga, a 40-year-old guard, who stood at the head of the line at the polling station nearest from the Independent Electoral Commission based in the capital of Kinshasa. Kunga said investors do not dare to come if security cannot be guaranteed. Bantobueji Luse Celespin, an agent of the Independent Electoral Commission, shared Kunga's view, saying that he hoped, through the elections, his country would become a country governed by law so that it would attract foreign investment and develop. Sylvie Feruei, who is jobless and at her 30s, said she wanted to vote although she had no clear idea about whom to vote for. "Life is too hard, I hope the elections could bring changes to it," she said. The voters queued quietly at the designated area, waiting to cast their ballots. Voting at No.1 ballot area, where the station was located, began about one hour later than the official start time as international observers and party representatives who watch the elections did not arrive on time, according to Pansy Tlakula, chief electoral officer from South Africa. Tlakula said this was a result of lack of experience in organizing elections, but the elections were overall "well-organized." According to an election official, 25.7 million voters will cast their ballot at 49,746 polling stations across the country, 8,518 stations of which are in Kinshasa. The result will be known three weeks later. If no candidate gains over half of the ballot, a second round of voting will be held. 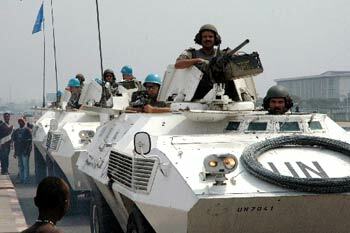 Twenty blue helmit, with one armored vehicle, were deployed at this polling station, being part of the 17,000-strong United Nations peacekeeping force in the DRC, the world body's biggest mission. The eastern part of Kinshasa, where opposition enjoys mass support, has remained calm and reported no violence, said an officer of the UN troops. The European Union also dispatched 1,100 peacekeepers, 200 of which are combat troops, to assist the DRC in the historic general elections. The international community has donated 422 million U.S. dollars to assist the historic elections, with the European Union being the biggest contributor and more than 1,700 international observers have arrived in the country to monitor the voting and counting process to ensure transparency.